Relax and enjoy more than 90 minutes of good old fashioned southern gospel Heaven on Earth. Great songs of the Christian faith in the well loved Gaither spirit of praise and fellowship. Women of Homecoming DVD 1 brings you the finest female vocalists of Christian country music in the Christian gospel music tradition. Vocal stars including Amy Grant and Kristyn Getty join this classic gathering of all the Gaither Homecoming Women to create a multi-generational celebration with 90 praise-packed minutes of joyful melody and glorious words. In this collection of more than 90 minutes of good old fashioned southern gospel, you’ll hear the great songs of the Christian faith delivered in the well loved Gaither spirit of praise and fellowship. You’ll also share in powerful testimony and soul stirring stories from the lives of these women of song whose voices bring the glory of heaven to earth. 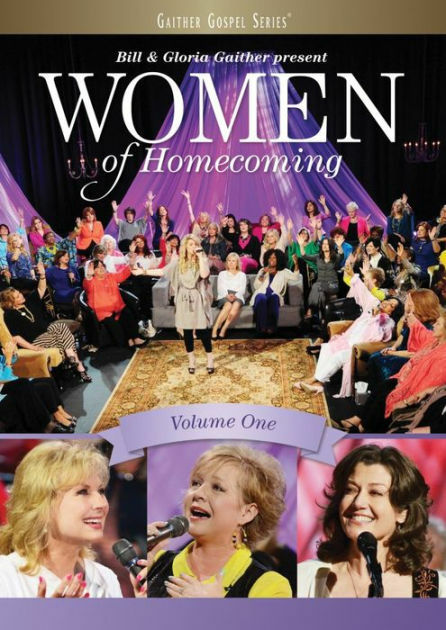 Women of Homecoming Volume 1 DVD by Gaither was published by Gaither in November 2015 and is our 6624th best seller. The ISBN for Women of Homecoming Volume 1 DVD is 0617884631796. This is a good DVD with some of the popular female singers from the Gaither DVDs, but also with quite a number of newer singers. We should have liked to give it five stars; however, it was spoilt for us by the humour of the unnecessary male comedian. Cannot understand why they always seem to find it necessary to include humour, which upsets the mood. Therefore, being unable to give 4.5 stars, we have to give it four - unlike volume 2, which deserves five stars. That DVD contains humour from Allison Durham Speer, which is very entertaining! Got a question? No problem! Just click here to ask us about Women of Homecoming Volume 1 DVD. Including Kristyn Getty, Amy Grant, Natalie Grant and The Isaacs.